Student activity on campus, during snack. 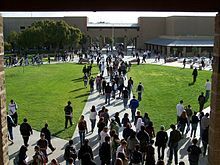 Brea Olinda High School is a 9th–12th grade public high school located in Brea, California. Established in 1927, the school was originally located across the street from the Brea Mall in what has become the Brea Marketplace. In 1989, the school moved to its current location on the northern hills of Brea. The school has a current enrollment of approximately 2, 000 students and is part of the Brea Olinda Unified School District. is map shows the incorporated and unincorporated areas in Orange County, California, highlighting Brea in red. High school students from Brea and Olinda originally attended Fullerton Union High School. In 1925, a $320,000 bond was passed to construct a high school on Birch Street with land purchased from the Union Oil Company. The building was designed by T.C. Kistner with iconic columns and ornate portico. The high school opened in 1927 with the wildcat mascot that represented both the animal and the independent oil drillers in the area. By 1989, the school population had grown and the high school needed major renovations. The school district decided to construct the new Brea Olinda High School at 789 Wildcat Way, and it opened in September 1989. Eight honors courses and 15 Advanced Placement courses are offered, including AP English Literature, English Language, French, Spanish, European History, American History, Government, Economics, Statistics, Calculus AB, Calculus BC, Chemistry, Physics, Biology and Environmental Science. Many students take an optional seventh period for electives like ROP photography and police science, drawing, ceramics, woodshop, drama, instrumental music and choir. In the fall of 2005, the school launched the Global IT Academy, an accelerated program in emerging technologies enhanced through global partnerships in education and business. ^ "Brea-Olinda High". National Center for Education Statistics. Retrieved March 4, 2019. ^ Malebranche II, Mark R. (2016). "Brea: Cosmopolitan Present from Provincial Roots". Orange Countiana. Orange County Historical Society. XII: 69–71.